Pudding or dessert is not something I cook for my children on a daily basis but was something I took for granted in my own childhood. Rice pudding, semolina, bread pudding, bread and butter pudding, apple crumble, blackcurrant tartlets, it sounds like I’m reading from an Enid Blyton book. One of my earliest memories is standing on a chair at the kitchen table, mixing the pale pink powder from a paper sachet with a little milk and sugar to make a bright orange paste. My Mum would add boiling milk, stir quickly and a jug of custard would be made. Many people shudder at the thought of the skin of the custard but my sister and I fought over it. When I discovered the real vanilla stuff made with eggs and cream my early craze for custard was cemented for life, so when I threw out an invitation to mingle the theme was obvious. I hope you enjoy this fantastic selection which takes custard to so many different directions. I think it’s right and proper to start with Meeta from What’s For Lunch Honey?, the creator and uber-host of the Monthly Mingle. This Spiced Advocaat Custard is so pretty, I’m feeling festive now and have added making my own advocaat to my list of Christmas cooking. Thank you Meeta. Farwin from Love and Other Spices matched mint with with nougat inspired by secret cooking courses with Mrs Yvonne (read the full story on her blog) to make this Mint Custard Pudding with Brown Nougat. Kate from The Little Loaf brought chocolate and mint to the party with a Chocolate Marquise with Mint Creme Anglaise (while you are over on her blog, have a look at her garlic baguettes too). My friendship with my sister is one of the most important things in my life, so can you imagine having a sisterly food blog? Sara from Three Clever Sisters served up these gorgeous Maple Pots de Creme (baked maple custard) in very cute Staub pots. Sukanya from SaffronStreaks gives a ‘toast to all those sweet and happy memories’ with Chocolate Hazelnut Pots de Creme. And now to a trio of custard classics, first by a classic and talented cook Dima Sharif. If you live in Dubai she’ll teach you how to make these Mini Eclairs with Custard Filling in her warm and welcoming kitchen. Highly recommended. If you’re at a restaurant with friends and crème brûlée is on the menu I’ll bet you that at least one person will order it. Check out this Honey Cardamom twist and some beautiful pictures of Lyon in the Autumn sunshine on Sunday Dreaming. I always learn something completely new from my friend Sandy at Ginger and Scotch. She made these wonderful Hong Kong Egg Cakes (Gai Daan Jai) which are a taste of her childhood and it seems like her son, Wee Scotch, likes them too. Do pop over to her blog and take a look. Milky puddings are loved in the Middle East so I’m delighted to see this regional favourite from Cook Like Mom – complete with step by step instructions. Spandana calls this Caramel pudding or flan but here in the Gulf it’s our favourite Creme Caramel. Bravo (and where’s my spoon?). Dina of According to Dina made a glorious, golden, Grandma’s Custard Pie. Dina I could hug you – can I come over for a slice? 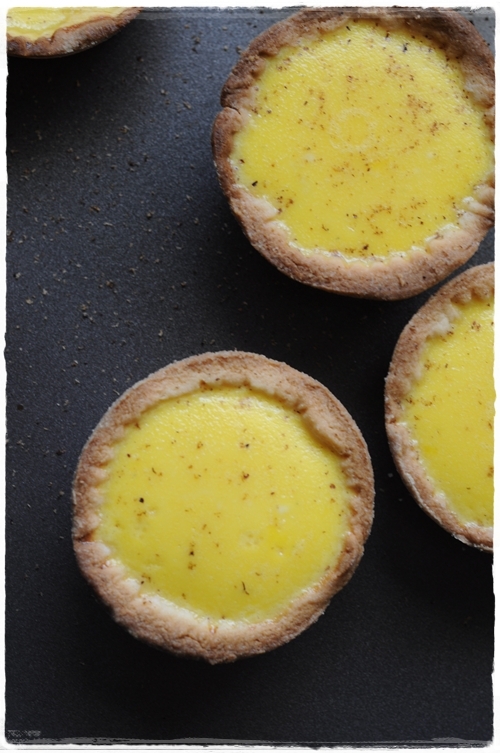 And here are the grandchildren…Najla from Foodie Corner made these Custard Tartlettes. The fruit on top look like gleaming jewels. Ligonberries are in season in Finland at this time of year. Unfortunately they are thin on the ground in Dubai so Minna of Naked Plate created this beautiful Cranberry Custard Dessert complete with Finnish gingerbread, cranberry relish and creme anglaise. It’s strawberry season in South Africa, hard to imagine if you are putting on the central heating in the Northern Hemisphere. If so bookmark this beautiful Strawberry Soup with Custard from Pink PolkaDot Food made by Zirkie. Staying the Southern Hemisphere for Lavender and Lime‘s Baked Chocolate Custard. Tandy used fructose instead of sugar for this dessert which she says takes very little effort to make. I should think it’s very easy to eat too! Borer beetles stave off insomnia better than custard according to Cindy, the one and Only Cin. She’ll explain over on her blog but here are her favourite uses of Creme Anglaise – poured over a rich chocolate cake, or layered with preserved green figs from Granaat in the Karoo in a trifle that is a sublime mix of bitter and sweet. More trifle in the form of a ‘Custard Day Out‘ – sounds good to me. Foodee spent some time in the kitchen with her Mom making Fruit and Custard Trifle. Her family approved highly. Thanks so much for mingling Dee. La Mere Culinaire made a beautiful Barbados Cherry Custard Cake. The fruit is also called acerola and grows on a tree in Arwa’s garden. It’s packed with Vitamin C and tastes sweet and sour at the same time. I know this because she kindly picked one for me the other day. I love the way the fruit is roasted and teamed with custard both inside and on top of the cake. Suma from Cakes and More! made the creamiest, vanilla-flecked Creme Anglaise, English Custard Sauce, Homemade English Custard…call it what you will. Please pour some over here Suma it looks divine. Custard does not just mean sweetness – although you could have been forgiven for thinking so from the delectable desserts above. So delighted that Assia made this Leek and Rice Moussaka over on Assia’s Kaleidascope. And one of the most intriguing recipes from Divalicious in Dubai. Angela made a sugar-free custard using an ingredient that I had never heard of before – erythritol. Combined with egg yolks, coconut milk and spices she baked the custard inside a small pumpkin. How pretty is this Thai Pumpkin Custard? Sanjeeta’s speciality is a Litebite and made vanilla custard bread pudding and chocolate custard bread pudding both egg-less. They look lovely and crunchy on top. Good Food Ends With Good Talk is the name and sentiment of Faseela’s original blog. She got really busy with custard making Custard Cashew Cookies and giving her recipe for Basic Custard which is studded with cashews, almonds and raisins. My own entry to the mingle was also Vanilla Creme Anglaise but I’ll leave you with a sneak preview of some custard tarts I made the other day. Thanks to Meeta for inspiring and everyone who joined in to make this a wonderful mingle of custard. Have we included your favourite custard dish? All these puddings look amazing. Everyone did such a good job! I particularly liked Meeta’s advocaat and Sandy’s Hong Kong egg cakes but I couldn’t go to her site. The link is broken. Congratulations Sally on hosting a wonderful mingle! Hi Magda – I just reload and checked all the links so you should be able to visit Sandy’s site. It’s well worth a visit. Hi Magda – I’m so happy that you like the look of the Hong Kong egg cakes – hope you enjoy reading the post! Wow, what a delectable collection of custards – might take up the challenge and work through each one. Thanks Sally for always inspiring. Thanks Tara – always appreciate a comment from you. That would be a custard challenge indeed. What an amazing display of custard! All look thoroughly gorgeous! The chocolate and mint looks devine! And am mopping up my drool from the keyboard over the eclairs…. Yes there are some really special recipes here. I might have to pop over to Dima’s Kitchen myself for one of those eclairs. Ohhh, this custard feast warms my heart. I loved it all, but I think my first attempt may be Sanjeeta’s irresistable custard bread puddings – two favorite desserts in one! …one more thing, I’d like to apply for the Cuckoo for Custard Club. Where do I get an application? There’s always room in the custard nest for you! Custard is my all time favourite dessert. As simple as a bowlful of custard with fruits can make my day. This round up is stunning. You know Anita, I should have done some banana with custard – simple comfort food. What a great roundup! A pity I didn’t participate… I will post a custard-based recipe tomorrow. I would LOVE to see your custard creation Rosa. Oh that is a lot of custard delicacies..got to try them this festive season. Thanks for such wonderful theme Sally, enjoyed baking with custard. I’m so glad you came along for the mingle. I’ve really enjoyed it myself. Oh, I soooo enjoyed this post! I tend to love all things custard, and like you, have many family memories centered around it. This was a terrific round-up–such inspired recipes. I particularly was drawn to several that used cardamom. Thanks! Yes, I’m intrigued by that flavour combination Victoria. I’ve got some cardamom sugar infusing so will give it a go when making custard. Oh that was fun! Everyone did a beautiful job! As I sit here eating my Ambrosia custard from a box, I’m feeling rather sorry for myself 😦 These creations all look wonderful and I love the look of your sneek peak custard tarts. Eagerly await the recipe and sorry again for not being able to participate. I didn’t know that custard was involved in all of these beautiful looking creations! Thanks for lovely the round-up. I realy enjoy this mingle and all the contributions are looking wonderful!! I will have to make a few because my children loves custard!! Wow wow wow! As I said, it’s my first mingle and I feel so excited to be part of all these custard creations! I love the recipes that everyone’s worked on…it just goes to show how creative so many food bloggers can be. Thanks so much Sally. Thanks Sally for hosting this lovely mingle.Glad to be a part of it and see all those wonderful creations. ‘Bliss’ pretty much sums up how I feel about all these divine-looking creations. Your evocation of the funny custard powder that looked to be the palest tutu pink but turned orange really took me back, Sally. Oh my … I am HUNGRY for custard. I’ve been MIA for too long and missed this beautiful MM. 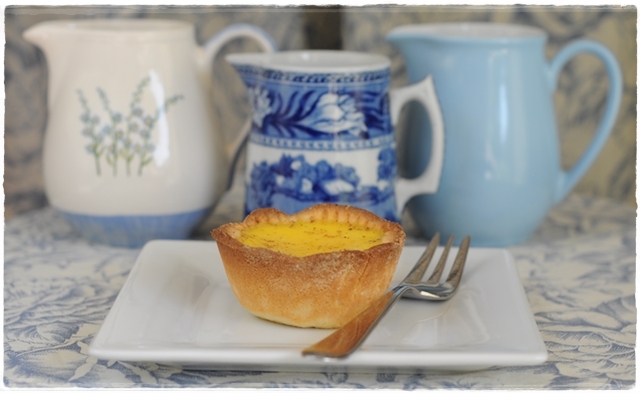 Love the little custard cups you made Sally… and the whole line that followed. Just fingerlicking good-ness!! Oooops sorry me again. Had to tell you I LOVED that first picture, blue pottery and all! Made my heart skip a beat! Thank you Deeba – I didn’t quite capture exactly what I wanted here so it’s really nice to get a vote of confidence, especially from such a talented photographer. All your shots make my heart skip a beat! What a divine post all about custards in all forms & in all sort of desserts! Every recipe rocks, looks utterly delicious & apart! Hi Sally I just discovered yr blog. I can’t believe I have not read it before. Of course your blog won the independent and national papers awards. Your blog, yourself and your food are very genuine:) I live in Dubai and I am hoping to start a small cooking school . Is it possible to get in touch with u via email. Thank you, we were looking at chocolate cake and mint custard as a must for our cafe bar. Mint custard – not for me I’m afraid…it’s the creamy vanilla that I adore.